Have you been faced with the situation where you occasionally use 'Reply' instead of 'Reply All' in Microsoft Outlook? Only one respondent from the whole list gets your reply in this case. Other recipients never receive your email and you never get an answer. Time is lost and results are not achieved. Obviously such annoying mistakes can seriously interrupt progress and even damage your reputation. A new component in the MAPILab Toolbox - "Reply All Forget" doesn't add any addition buttons on the ribbon. If your email message has multiple recipients, then when you click the "Reply" button the component specifies your choice and requires your confirmation regarding recipients. So if you click 'Reply' instead of 'Reply All' by mistake, the component corrects it by providing the opportunity to send the message to all recipients. Moreover, their addresses will be added in the 'To' field automatically. You need to activate the required components after MAPILab Toolbox is successfully installed. 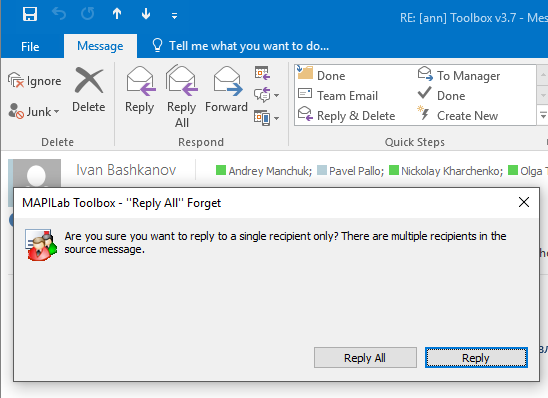 Be sure that the "Reply All Forget” component is checked in Toolbox settings. No more settings for the component is required. Reply: the answer will be sent to the first recipient from the list. Reply all: all recipients will be added in the 'To' field automatically and the message will be sent to all recipients. You also can cancel sending. 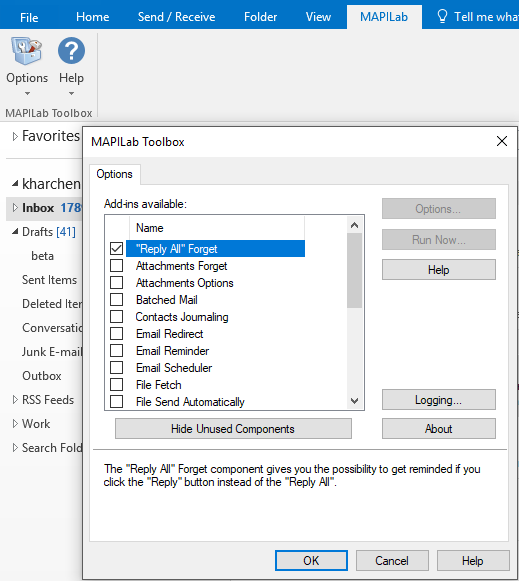 The "Reply All" Forget component is one of the 20 add-ins included in the MAPILab Toolbox. You can find out more about the other components and download the trial version on the MAPILab Toolbox product page.